Frank Pearce was the first scholar to use the term 'crimes of the powerful.' His ground-breaking book of the same name provided insightful critiques of liberal orthodox criminology, particularly in relation to labelling theory and symbolic interactionism, while making important contributions to Marxist understandings of the complex relations between crime, law and the state in the reproduction of the capitalist social order. 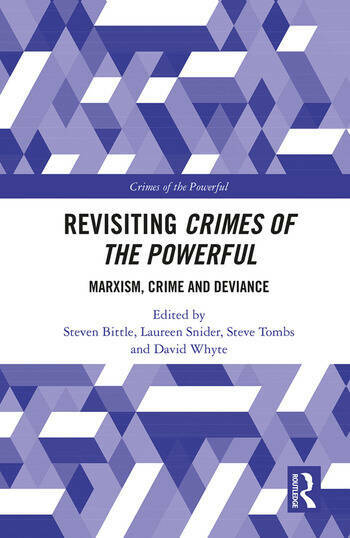 Historically, crimes of the powerful were largely neglected in crime and deviance studies, but there is now an important and growing body of work addressing this gap. This book brings together leading international scholars to discuss the legacy of Frank Pearce’s book and his work in this area, demonstrating the invaluable contributions a critical Marxist framework brings to studies of corporate and state crimes, nationally, internationally and on a global scale. This book is neither a hagiography, nor a review of random areas of social scientific interest. Instead, it draws together a collection of scholarly and original articles which draw upon and critically interrogate the continued significance of the approach pioneered in Crimes of the Powerful. The book traces the evolution of crimes of the powerful empirically and theoretically since 1976, shows how critical scholars have integrated new theoretical insights derived from post-structuralism, feminism and critical race studies and offers perspectives on how the crimes of the powerful - and the enormous, ongoing destruction they cause - can be addressed and resisted.